The 22nd edition of the Dubai Entertainment Amusement and Leisure (DEAL) show took place in April at the Dubai World Trade Centre. Focused on the Middle East, African, Mediterranean and Asian regions, the exhibit hall played host to over 300 firms involved in the industry. Interestingly, the UAE was not the most represented country at the show. 52 exhibitors came from China, followed by 33 from the UAE. 26 vendors hailed from Italy, the UK had 24 and the US was represented by 21. InPark Magazine was among those 21 US companies, and spent the week exploring not only the DEAL trade show floor but also the region. DEAL seemed to primarily cater to the FEC market, with roughly half of the floor devoted to that line of business. The line between vendor and operator seemed blurred at times as several high profile licensee companies also held booth space. Hoping to entice developers and investors to open more of their branded locations, companies like Landmark Leisure, Al Hokair Group, and Al Othaim Leisure & Tourism Company made an impressive showing. At Holovis’ booth, IPM Editor Martin Palicki gets attacked by a virtual creature during a demonstration of the company’s Augmented Reality system. The themed entertainment segment also had a cadre of companies in attendance including Alterface Projects, Dynamic Attractions, ECA2, Holovis, Intamin, JoraVision and Vekoma. Waterpark vendors featured Neptune Benson, Polin Waterparks, ProSlide, and WhiteWater. Additionally, IAAPA (International Association of Amusement Parks and Attractions) and TEA (Themed Entertainment Association) both were represented at the show. Although the trade show floor seemed noticeably slow, exhibitors like ECA2 Chairman and CEO Jean-Christophe Canizares noted that attendees consisted of “serious buyers” with real projects in mind. The mood in Dubai is optimistic. As noted in Editor Martin Palicki’s March column, projects long talked about in the region are now actually being built, with the capstone Expo 2020 in Dubai’s very near future. Organized by TEA’s Europe & Middle East division and spearheaded by Paul Kent and David Willrich, a bus full of TEA Members ventured into the desert one morning for a behind the scenes tour of the popular Global Village attraction and the soon-to-open IMG Worlds of Adventure. The group was greeted by Chief Operating Officer Viviane Paturel-Mazot along with other leading executives from Global Village. As Viviane toured the group through the new World Avenue (one of the few permanent structures in the park), she explained the company’s business model. Global Village could be thought of as a retail and entertainment focused world’s fair, or EPCOT World Showcase. It operates during Dubai’s “winter” season, roughly November through April, and is only open in the cooler late afternoon and evening hours. The main component of the park is 32 pavilions, each one tied to a specific country. Global Village bids out the pavilion spaces and country organizers then commit to building a temporary and highly themed pavilion, within which guests find food, merchandise and entertainment native to that pavilion’s country. Although each organizer is responsible for filling up their pavilion, Global Village exercises design approval authority and requires authenticity and diversity in the merchandise available. Viviane joked that it truly is a global marketplace, with her friends constantly asking her to stock up on items like Tunisian honey or African black soap for them. Park visitors often fill up shopping carts, particularly near the end of the season, when vendors are more likely to bargain and clear out their stock. Additionally, Global Village contracts with a more traditional carnival company that brings in temporary rides and operates on a revenue share basis. Global Village also operates an amphitheater stage, bringing in a variety of acts throughout the season, oftentimes filling the large grassy area in the center of the park. It’s a rather brilliant plan. Global Village retains control of the facility and sets the direction, but hands off nearly all of the work out to pavilion organizers and other contractors. And it’s a model that is working. Even though Global Village charges only a nominal 15 AED entrance fee (roughly $4 / €3,50) it has been in operation for nearly 20 years and draws over 5 million guests each season (particularly amazing given it’s relatively short number of annual operating hours). The site’s many pavilions were in early stages of demolition as the tour continued, and Viviane noted that contracts for the 2016 pavilion were being issued shortly. She led the group to the Global Village offices where TEA members learned more about the park and were able to engage in a Q&A with park staff. Of particular interest to the group was the park’s role in securing over 10,000 work visas for foreign staff to operate pavilions as well as the park’s ability to attract talent for their entertainment offerings (which was recently brought in-house). On the latter, park executives aren’t worried about competition with new theme parks opening; the entertainment pool is large and their relationships with existing performance groups are strong. After some light snacks and coffee, the bus took guests to the nearby IMG Worlds of Adventure, which was busily preparing for its recently announced August 15th opening. The indoor park covers 1.5 million square feet and will offer four adventure zones (Marvel, Lost Valley, Cartoon Network and IMG Boulevard) along with a cineplex. Although TEA Members were given an exclusive behind the scenes look at the park as workers began to put the finishing touches on theming and attractions, all the details are still being kept strictly under wraps. The group did gather for one photo in the sand next to the park’s iconic outdoor roller coaster, The Velociraptor. Later the following night, a wide assortment of TEA members and guests gathered at Ruth’s Chris Steak House. Sponsored by Oasis Enterprises and Paragon Creative, the mixer spread across the restaurant’s bar and outdoor balcony patio. 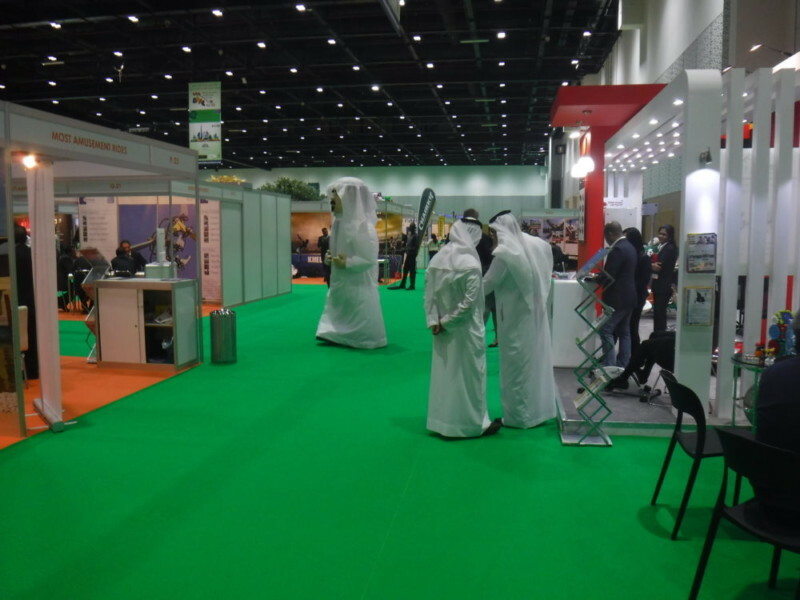 Combined, the special tour and mixer organized by TEA complemented the DEAL expo and effectively brought leaders of the themed entertainment industry together in the UAE. InPark took an afternoon to visit Dubai’s original waterpark: Wild Wadi. Opened in 1999 the park is part of the Jumeirah properties and sits in the shadow of the iconic Burj Al Arab. Burj Surj and Tantrum Alley fill the lower left corner of this arial park photo. The park is deceptively small. Even though it occupies only a small area, winding pathways and a series of interconnected waterslides keeps attractions hidden from one another. The park also benefits from its constructed terrain: Master Blaster slides hug the ground and take guests up and down quickly without needing many slide towers. The slides deposit riders into the park’s meandering lazy river. The park only has two towers. One provides access to the Jumeirah Sceirah, a pair of WhiteWater Speed Slides with AquaLaunch. The other feeds Burj Surj and Tantrum Alley, two family raft ProSlide attractions added in 2010. Jumeirah Scierah features twin speed slides with AquaLaunch starts. A large wave pool sits in the center of the park next to a WhiteWater AquaPlay Rainfortress and WhiteWater’s FlowBarrel surfing wave greets guests near the entrance. Even with its small footprint and density of attractions, the park boasts a large amount of relaxation space, including a raised deck featuring views of the Burj Al Arab and the Gulf. Wild Wadi is a perennial favorite in the annual TEA and AECOM Theme Index, and boasted 725,000 guests in 2014, ranking it in the Top 5 waterparks in the Europe, Middle East and Africa region. Before leaving Dubai, InPark headed to Abu Dhabi and Ferrari World to meet up with George Walker, Creative Director at Ferrari World (and VP Creative for Dynamic Attractions). George has been instrumental over the past few years in helping Ferrari World transition into a more themed environment that complements the stories being told in the attractions. And he’s helping upgrade the park’s thrill and entertainment factors in a big way. George took us down the newly themed Italian Street, Via D’Italia. The detailed facades feel very “lived in” and are intended to bring a slice of Italy to this park in the desert. The little touches like interactive doorbells, animatronics and great attention to detail are highlights of the highly themed boulevard. George is proud of the “hidden” Ferrari logo horses found throughout the street, and the thought-out dialogue one hears when pressing one of the many storefront doorbells. Behind the facades lies one of the parks coasters under construction. The Dynamic Attractions SFX coaster will be a heavily themed, story-driven experience that incorporates scenically integrated media, sophisticated moving track systems, thrilling inversions, special effects, and a powerful launch when it opens in 2017. Work is also progressing on the park’s second all-new coaster in development, an exciting launch coaster that will shoot guests out of the park, through the iconic glass funnel and red roof, up a tower constructed in the park’s center. With it’s peak just half a meter shy of the flight path limit, guests may be lucky enough to catch a close-up glimpse of the underside of a jumbo jet landing at the nearby Abu Dhabi airport. George was careful about making the thrilling attraction engaging for all members of the family. Those not riding will have fun looking down through a glass platform over the tracks as the coaster launches beneath them. A guest viewing area was also an important part of the park’s latest coaster, Flying Aces. George provided an up close tour of the attraction’s queue, (featured in InPark Issue #61) which is an immersive storytelling engine that prepares you for the ride that waits at the load station. The ride itself is pretty thrilling too, with a fast cable lift and a non-stop series of inversions and airplane-inspired dives. Before heading out, George showcased the park’s newest dark ride attraction, Benno’s Great Race. Featuring a trackless ride vehicle from ETF and interactive gaming system by Alterface Projects coupled with the game play provided by Pure Imagination, guests use magic “wrenches” to play interactive games at a variety of screens interspersed through impressively crafted scenery. The attraction is lengthy and fun and pushes the boundaries of a typical “shooting” game by encouraging guests to focus on the scenes to solve them, which draws them further into the story. It’s indicative of the direction Ferrari World is heading, combining high quality rides with impressive technology and theming. It’s a direction the entire Middle East region, and especially those attending the DEAL event, will hopefully follow.